High rim and reverse curve on one side aids in scooping food onto a utensil without spilling. Bottom of dish has a rubber suction base to prevent skidding. Bowl is Dishwasher safe (bowl only, not a suction cup). Plate is Dishwasher safe (plate only, not a suction cup). Permits dribble-free drinking without raising head. The mouthpiece is large enough to use with straw. Graduated at 4, 6, and 8 oz..
High rim and reverse curve on one side aids in scooping food onto a utensil without spilling. Bottom of dish has a rubber suction base to prevent skidding. Vacuum feeding cup permits dribble-free drinking without raising head. 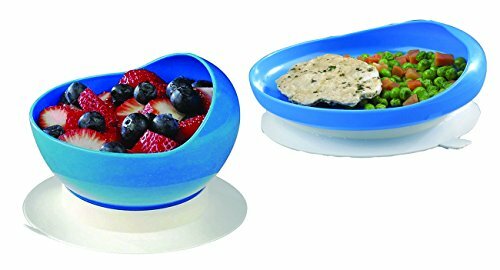 Bowl, Plate and Vacuum Feeding Cup are Dishwasher safe (not suction cups).